My Ideas Are Making Me An Insomniac? It happens around 4:30am. I am half asleep and my creative “think engine” starts to send ideas my way. I really do not want to think this early. I want to s-l-e-e-p. I know they are really great ideas and that they will be gone like a puff of air if I do not pay attention to them but I don’t want to wake up! Most of my life I had to awaken early to go to my job. Now I have a choice. You think? Years ago, when I was painting full time, I started my day with what artist’s call ‘morning papers’. The concept is to have a notepad ready by your bed (phone texting is not accurate at 5 am) and then you write everything that comes into your mind before your real brain wakes up and says, “I need coffee”. I got some great painting titles that way. This week, I found some of my morning notes when I was reorganizing my studio. The ideas were really good! Only now, I don’t need to arise early and my internal clock is moving to a more sane time. I wonder if there is a way to dictate my ‘morning papers’ into my phone? But then, I have to be more awake to put in the password, find the icon, etc. No I’ll pass on this one. I wanna sleep but I don’t give in to it. The creative center of the brain works when we are slowed down. In a relaxed mode, ideas can come forth. Creativity is birth on the right side of your brain. It is the abstract thinking side, not the analytical side. The idea is to access the right brain for ideas. Our best thinking is not when we TRY but when we incubate ideas and let them kind of ‘cook’ until, shazam’ it moves into the understanding part and makes sense. I start with a fuzzy concept like I want to express the colors I love and textures, which is the basis for a lot of my work. I get my paints out and play around. I may start scribbling, drawing nonsense, like leaves or squiggly lines or doodles. Slowly, something is birth forth and I take it from there. 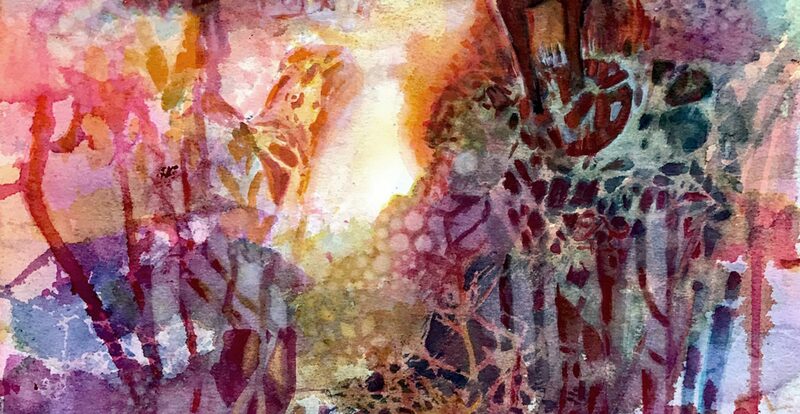 I might start adding texture to my substrate of choice (canvas, illustration board or watercolor paper). I can do this wth crumpled tissue paper, gels, even fabrics that I can gesso over. Then I start adding color. For me, this is the intuitive part. My ideas start to build on each other and I may end up working mostly in inks or oil pastels. I go with what feels right. I have learned to trust myself and my sense of balance and unity. My work is not considered finished until I put it away for several days and then critique it for what does not ‘feel’ right. I trust my instincts. You need to learn to do this too. Give yourself permission to explore and have fun, then go with it. The ideas will come. Yes, they will. Relax!